It has been revealed that Barcelona coach Tito Vilanova will return to New York this week for further medical attention following his cancer scare. It is said that the 44 year old had planned to have the treatment during the summer but he has confirmed he has brought it forward after Barca won their fourth Primera Division title in five years with three games to spare. 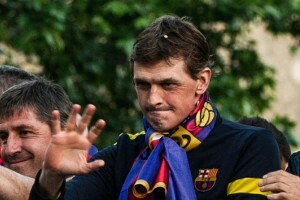 Having spent two months in New York earlier this season, when he underwent radiotherapy and chemotherapy treatment, Vilanova went back a fortnight ago for follow up tests. It is planned that he will only be away from the club from Monday to Friday. A statement on the club’s official website said: “Tito Vilanova has confirmed at a press conference that he will have further treatment for cancer next week in New York. The pioneering treatment has been developed at a specialised centre and is proving particularly effective.